Creating a story where magically gifted students attend a school to teach them how to handle their abilities has become something incredibly common in the anime world and is growing increasingly common in Western media as well. As such, Tokyo Ravens has a bit of a hill to climb to try and set itself apart from the rest of these series. 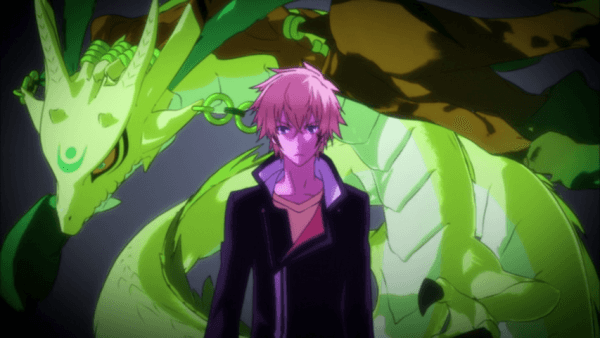 While Tokyo Ravens is an anime adaptation of a fairly long running light novel, is the first half of the series worth picking up? 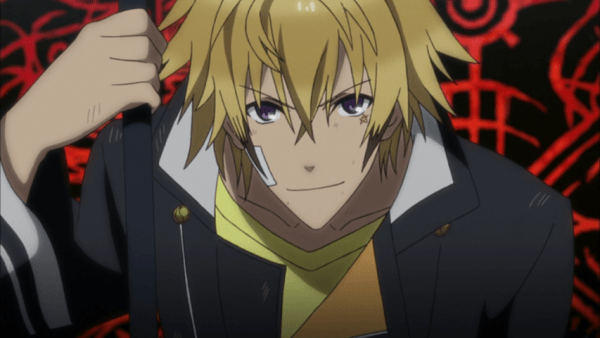 In the world of Tokyo Ravens onmyo mages are commonplace and often serve as a police force as they have to deal with numerous spiritual disasters, rogue mages, and the concept of using familiars as weapons is seen as common practice. While large cities may see quite a lot of onmyo activity the countryside is usually a calm place. Here is where the series’ protagonist Harutora Tsuchimikado spends his time lazily attending classes and spending time with his friends Touji and Hokuto. Despite being a member of one of the most famous families of onmyo mages, Harutora is from a branch family and has always slacked off since he never had any talent for magic. The only time he thinks about the main family is when his childhood friend Natsume appears. Natsume is the star of the Tscuhimikado family and is set to take the leadership of the house eventually so all of the pressures of being an heir have been placed on her shoulders. While visiting, Natsume attempts to convince Harutora to travel back to Tokyo’s Omnyo Academy with her but he declines. This all changes when Suzuka Dairenji, the youngest of the Twelve Divine Generals (the highest class of mage) arrives in the village and drags Harutora, Touji, and Natsume into a whirlwind of trouble resulting in the loss of someone close to Harutora’s heart and a bit of mystery that must be solved. Due to these events, Harutora agrees to become Natsume’s familiar and travels with her to Omnyo Academy alongside Touji. Only problem is, once he arrives there he learns that not only is he far behind everyone else but that Natsume must act like a guy due to family tradition. To make matters worse, because of her lineage Natsume is being stalked by a large number of people who see her as the reincarnation of Yakou Tsuchimikado, perhaps the most powerful onmyo mage of all time due to his actions in the past who is seen as something of a god despite certain actions that he took. With Harutora having only his friends and a new cute fox familiar named Kon to help him out how will things unfold? Tokyo Ravens is the type of series that would have had a hard time gathering viewers at the start of its broadcast simply due to the fact that the first story arc is incredibly slow and feels like the worst part of the presentation. While it does serve as a way to introduce viewers to various aspects of onmyo magic and serve as a set-up to bring Harutora and Touji to the school, these initial episodes are quite slow but thankfully the series becomes far better once it shifts to Onmyo Academy and kicks the story into the next gear. 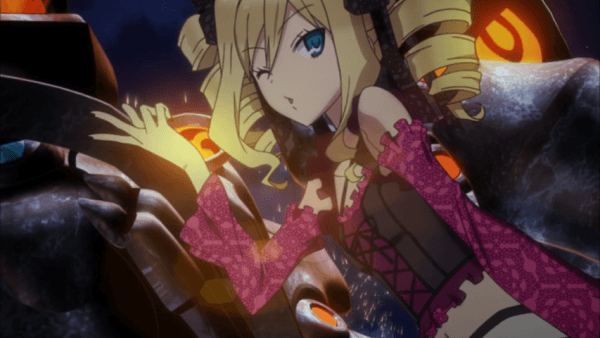 Few series are capable of taking the time to make viewers feel accustomed to the world and allow the supporting cast and main characters to develop as early as Tokyo Ravens does. Perhaps it is due to the twenty four episode run length, but once arriving at school viewers are treated to some excellent writing and pacing. We see Harutora adjust to school and deal with new acquaintances who think he is holding back the class only to then have to handle the first of the stalkers targeting Natsume serving as the proper introduction of the series only for things to escalate form there. Touji’s darkness and ties with Harutora are explored to a believable level which helps turn the character from simply being the “cool background friend” into someone viewers will keep an eye on and even one of the very first enemies in the series returns to try and find some form of redemption in the eyes of Harutora, even if it becomes more about torturing him with purposeful misunderstandings instead. 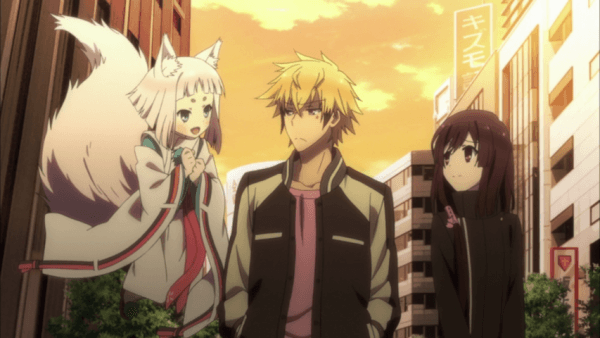 This is another aspect of Tokyo Ravens that shines throughout this first half as we see a fine balance established between drama, development, and humor since there are plenty of light-hearted moments mixed in and appropriate times. It is worth noting that viewers will have to keep a close eye on all of the characters presented in Tokyo Ravens as nearly every side character and adult is more than they seem. There are different secrets whirling around the cast and many characters appear to be far more capable or dangerous than they initially seem. Though the first half does end on a bit of a light-hearted note, there are still many dangers floating around Natsume and with numerous dark groups in motion and growing closer to taking open action, it will be interesting to see where things go from here. As far as the series’ artwork goes, 8-bit did a decent job with the series but unfortunately there is very little in the series that actually stands out. Most of the character designs are largely unremarkable with the only exceptions being Kon and Suzuka’s unique looking wardrobe giving her a different look from the rest of the cast. That being said, at least the background designs are rather enjoyable and the fights are cleverly animated with plenty of nice looking special effects when the characters use magic spells or whenever a familiar is close to defeat and phasing out of the world. It is worth noting though that the blend of CG elements for most of the familiars in the series so far is rather awkward looking as it does a poor job blending with the rest of the artwork. 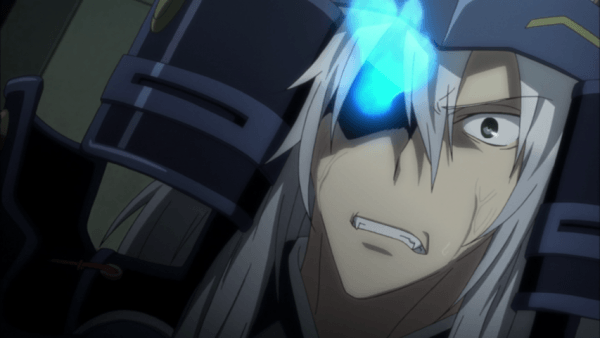 While some people may still prefer to choose the original Japanese voice track over FUNimation’s freshly recorded English dub, I must say that they should try out the English dub first. This is due to the fact that the company has done an excellent job selecting voice actors for Tokyo Ravens and the voice actors do an amazing job making these characters sound as impressive as possible. It also is nice to note that the background music is quite enjoyable with there being a nice mix of simplistic tunes and orchestral songs to fit the mood. As far as the opening and closing themes go, “X-encounter” by Maon Kurosaki was one of my favorite themes from 2013 and it continues to impress here while the ending “Kimi ga emu Yuugure” by Yoshino Nanjou is somber but ultimately forgettable. 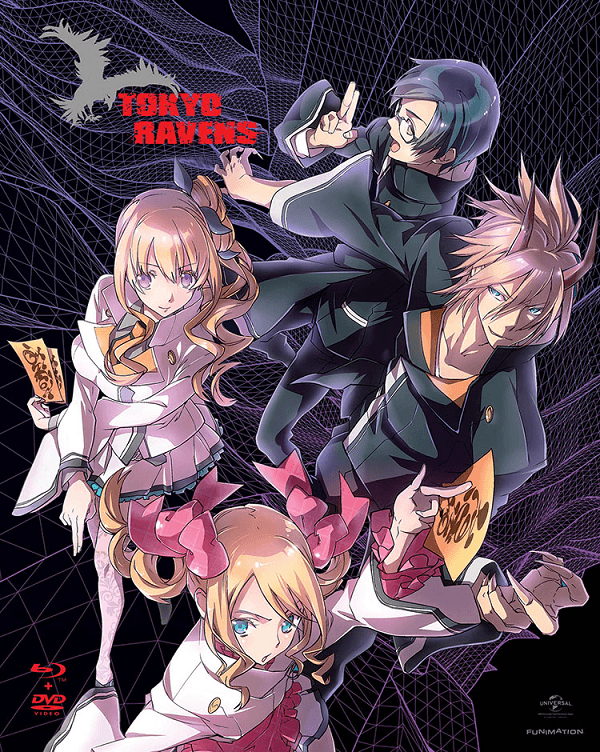 With this release of Tokyo Ravens Part One, FUNimation has included clean versions of the opening and ending theme, trailers for other anime series, two audio commentaries, a video commentary, and two short specials called “Kon Explains it All!”. The specials featuring Kon are presented in Japanese and feature her character going into detail about various aspects in the world of Tokyo Ravens that weren’t really explained over the course of the series and if it didn’t include footage from the series, would be great to watch first for a little bit of background knowledge. As for the commentaries, the first standard commentary is for episode 5 and features Monica Rial, the voice actress of Kon, Clifford Chapin, the voice of Harutora, and Ian Sinclair who voices Touji while the second commentary is for episode 12 and includes Jad Saxton as Suzuka, Leah Clarke who voices Kyoko, and Caitlyn Glass, the voice of Natsume. Both of these commentaries are fairly standard fare as far as FUNimation commentaries go with a few details about the show and casting discussed but mostly include the cast laughing and making jokes. Finally the video commentary, something I always see as a nice inclusion in a set, features ADR director Colleen Clinkenbeard, Monica Rial, Clifford Chapin, and Ian Sinclair as they talk about episode 7 with plenty of actual discussion on the episode and how intricate the series’ story can be. 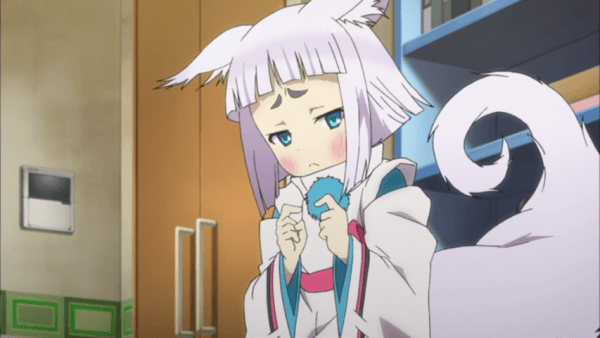 Tokyo Ravens could easily have fallen into the rut that many series do by falling back on tired clichés in order to get itself over for a little bit before coming to a halt but thankfully it has done the opposite of that. While the initial episodes in Tokyo Ravens Part One are indeed slow, the story only grows from there as we continue to see fairly consistent character development and steady story progression. With trouble brewing around Harutora and the group and plenty of possible ways for the story to continue, it will be interesting to see how things progress from the end of Part One, especially since “Stupidtora” seems to finally have realized a certain something he has been missing throughout the series.